It is a pleasure to welcome you to this issue of the Australian Medical Student Journal (AMSJ). After the very successful launch of the AMSJ’s inaugural issue in 2010, it has been decided that the journal will now operate on a biannual basis from this year. It has been almost a year since the AMSJ’s launch function, which was held on the 29th of April 2010 at the new Lowy Cancer Research Centre in Sydney. A sizeable crowd of medical students, clinicians and academics from across Australia were present for the event, including many of the authors published in the inaugural issue. Among the guests was AMA President, Dr. Andrew Pesce, who cut the ribbon from the first box of copies. Also present were many of the generous sponsors of the inaugural issue. 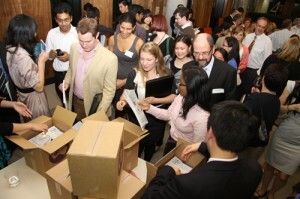 Following the launch, 2,500 hard copies of the journal were distributed to students Australia-wide via the twenty university medical societies. In early July, through a partnership with the Australian Medical Students’ Association (AMSA) Global Health Conference (GHC) in Hobart, copies were distributed to all 500 delegates. The new AMSJ website also proved to be a huge success, receiving around several thousand visits in the week after the launch, and over 15,000 visits in the months that followed. The second half of 2010 saw the roll-out of the first major phase in expanding the AMSJ’s staff structure. 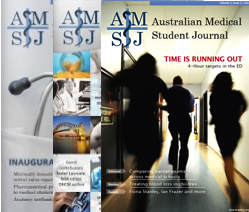 A national recruitment campaign has seen the AMSJ take on staff from all twenty Australian medical schools, giving the journal a tremendous presence in the student community within a short period of time. Check our staff list to find out who is the AMSJ Representative at your university. Continuing in the footsteps of the inaugural issue, this issue contains a broad range of high-quality student research, reviews and opinion pieces. Women’s and children’s health are particularly well represented in this issue, with articles covering the acute abdomen in pregnancy, causes of neonatal death, ovarian conditions, vertical Hepatitis B transmission, and the confidentiality rights of minors. Medical hygiene also comes under the spotlight with articles on alcohol-based hand rubs, and stethoscopes as vectors of infection. We have also published articles from an interesting range of guest authors, this time with a little more of an educational slant. Among others, John Murtagh (author of Murtagh’s General Practice) offers some advice on how to deal with baffling patient presentations, while Murray Longmore (author of the Oxford Handbook of Clinical Medicine) shares some tips on how to enjoy one’s patients more! Nobel Laureate, Peter Doherty, and outgoing editor of the Medical Journal of Australia, Martin Van Der Weyden, offer some reflections on their interesting career paths. We are also pleased to announce that we will be partnering with the AMSA Convention 2011 to present the 2011 NHMRC Student Research Competitions (see page 14). If you are in Sydney in July for the Convention, look out for us there. Once again, I offer a huge thank you to everyone who has made this publication possible, including the authors, staff, sponsors, and most importantly, our readers. I would encourage you to think of how you may like to contribute to the next issue of the AMSJ. Submissions are already open for the next issue, which is due to come out in September. Also, stay tuned for updates about our next round of national recruitment.